Oh my god - it's full of glitter!! Cost/Amount: USD$8.00 for 1.2 grams. Sample baggies also available at $1.30 per baggie. Aromaleigh seems to be adopting a business model I’ve seen on a few other MMU sites: the monthly collection. 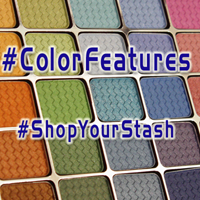 A new collection every 30 days or so, and only available for 30 days, so don’t wait to see others’ FoTDs, order your own sample collection and choose the colors you want! On the one hand, I love monthly collections because there’s newness coming out every month (and with a collection, I don’t have to buy the whole thing just to get two or three colors.) On the other hand, trying to keep up with the release rate of monthly “limited edition” collections isn’t really going to be a part of my world any more, with the economy changing the way it is. 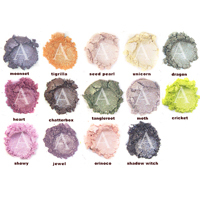 Additionally, Aromaleigh has the most costly MMU samples I’m aware of, with 6 or 7 applications’ worth costing $1, so purchasing samples of each and every “monthly” collection isn’t really a viable option. The swatches on the Aromaleigh site were a bit misleading: they powerloaded the pigments on the back of someone's hand so you essentually saw the same thing you'd see looking at a potful of the pigment, rather than seeing how the pigment would actually look as applied (like the swatch photos for the Spring Solstice collection, which were quite nicely demonstrative.) As the collection was inspired by seeing the floral museum at the Bellagio in Las Vegas, one would think that since orchids have such definitive colors that this collection would be similar in pigment weight. This wasn't precisely the case. Unicorn was all but invisible. Same with Orinoco, though applying it heavily could get you a decent glaze. Jewel was a bit weightier, but not by terribly much. Shadow Witch and Moonset were also both fairly "soft" colors, for all that they appeared to be the most vibrant in the collection. Bumblebee did have a bit more pigment to it, and was a nicer bright yellow. If I had it to do over, I'd not bother with Unicorn at all. I'm glad I was cautious in my purchases, even though a part of me initially wanted to get Dragon just so that I'd have the eye color pair of "Dragon" and "Unicorn" (and what a mistake that would have been.) I bought most of my fullsize jars when they were on sale, at $6 a jar rather than the "normal" Aromaleigh collection price of $8.